The Tuckasegee, or the "Tuck" as locals call it is the largest trout river in Western North Carolina. After flowing through Panthertown Valley, the Tuckasegee flows through a chain of lakes and comes out as a tail-water river. There are two different designations along the tailwater portion of the Tuckaseegee River: Hatchery Supported, and Delayed Harvest. The 5 mile Delayed Harvest section near Sylva, NC is without a doubt the most popular section of river with fly anglers. During the months of October through May, the Delayed Harvest section is stocked heavily, and all catch and release fishing with single-hook flies only. Being the Tuckaseegee is a tail-water river, its water levels change greatly due to power generations. If you plan to wade the Tuck, be sure to check the generation schedule that can be found in our “waterflows tab.” Floating the Tuck with one of our guides is one of the best ways to enjoy the river, with many different sections of river to see. The Davidson River is the most well known river in North Carolina. Trout unlimited names it as one of the top 100 trout streams in America. That being said it does get a lot of fishing pressure, but it also grows some really big fish! 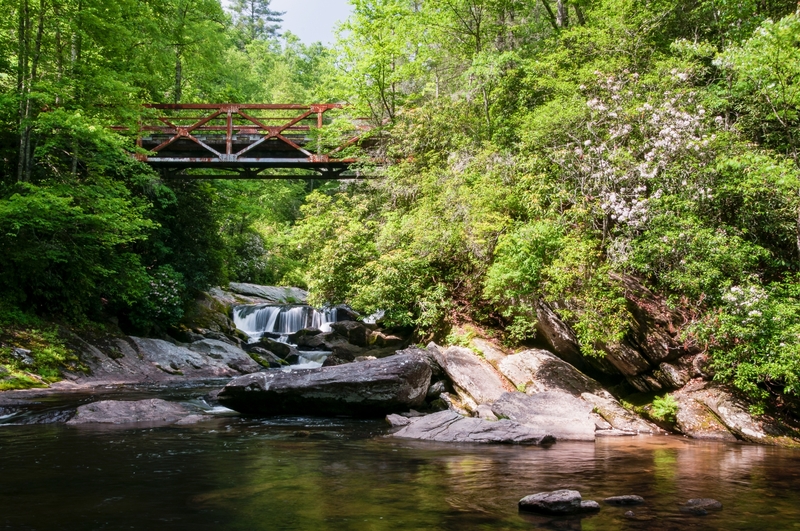 The Davidson River is located in Pisgah National Forest, which is near the town of Brevard, NC which is about a 45 minute drive from our shop in Cashiers. The Davidson is broken into two sections, Hatchery Supported and Wild Trout Catch & Release Fly Fishing Only. 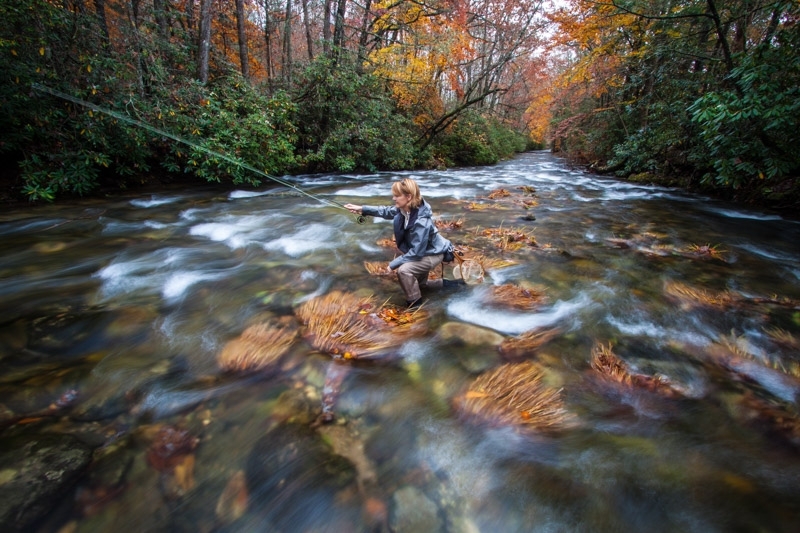 The fly fishing only section is everything from the Avery Creek Ranger station (a couple miles from the entrance of Pisgah National Forest) upstream into its headwaters. The Hatchery Supported regs are everything below the Avery Creek Ranger Station to the border of Pisgah National Forest. 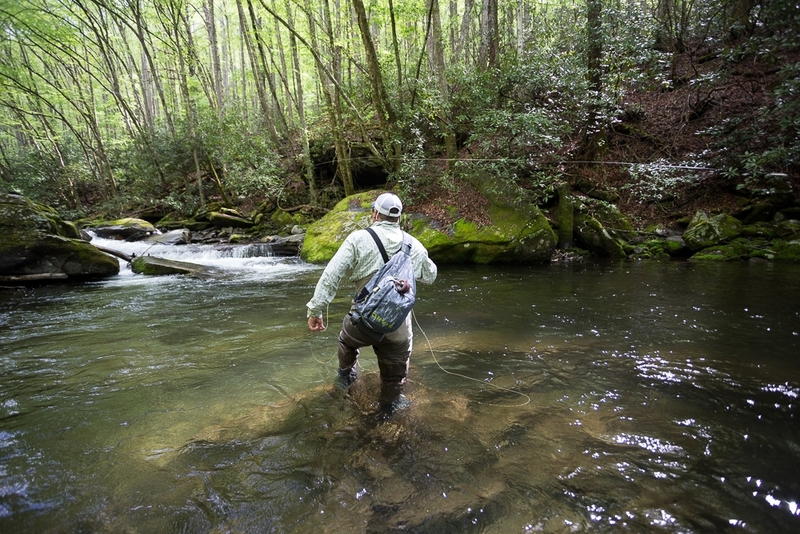 The Davidson is one of the most fertile trout streams in the southeast. Because of the wealth of available food, and the higher than average fishing pressure, catching fish here can be tricky. Small flies, light tippet, and a delicate drag free float are key factors to a successful day on the Davidson. The Nantahala, or "the land of the noonday sun" as the Cherokee language translates is another popular river for both fly fisherman and whitewater rafters. The river is broken into two sections: the Upper Nantahala and the Lower Nantahala. The Upper River is a freestone stream in the medium size category. This section provides some of the prettiest trout water in NC, and is very accessible to wade fishing. 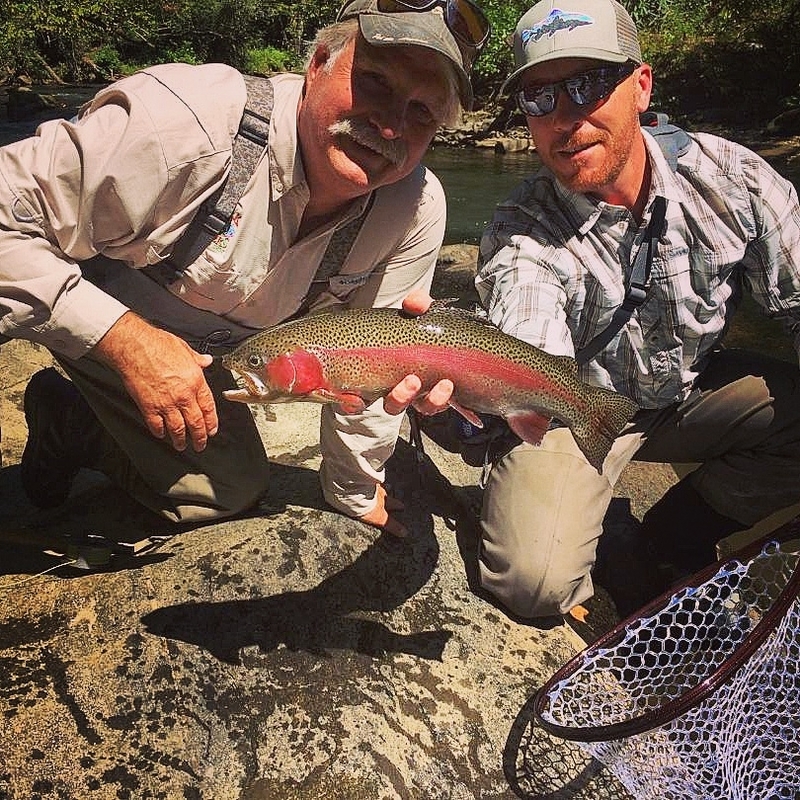 The Upper Nantahala is home to lots of wild rainbows and brown trout, and also sees supplemental stockings from the Delayed Harvest program. The Lower "Nanty" is dam controlled, and is one of the most popular whitewater rafting Rivers in the nation. Yes, that means during power generation that water is MOVING! Wade anglers take extreme caution around power generations. This section his home to some of the highest trout densities of anywhere in NC, and is also where the current NC State record brown trout was caught. **Note: To view Nantahala Generation Schedule, click on the link above and select "Nantahala" in the scroll down bar. The Headwaters of the French Broad River are the North Fork, East Fork, West Fork, and Middle Fork. They all come together near the town of Rossman, which is about a thirty minute drive from our shop. Each one of these forks is a very healthy, wild trout stream. The North Fork is by far the biggest of the forks. There is good access to the river from Highway 215 in the Pisgah National Forest. The East Fork is probably the most popular, due to stockings done by the state under its Delayed Harvest program. The Delayed Harvest section of the East Fork runs along East Fork Road, just outside Rossman. 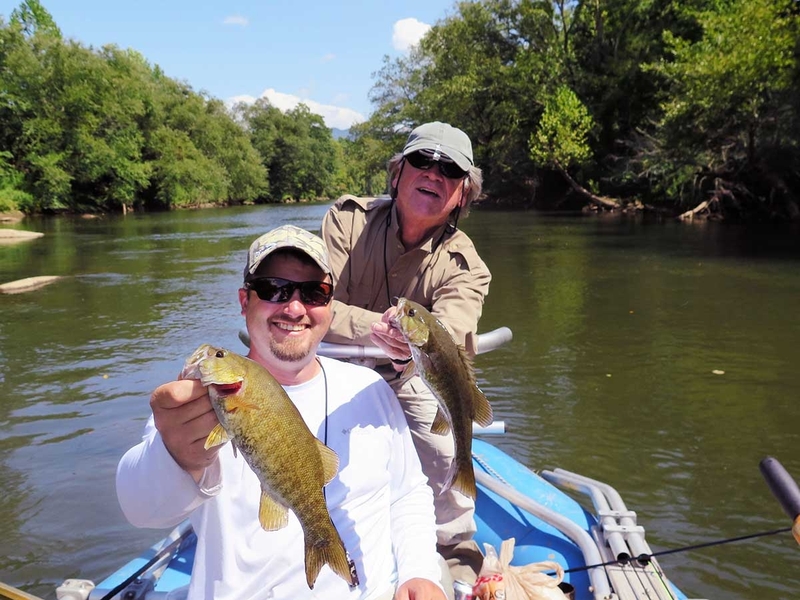 The lower French Broad is the largest watershed in Western North Carolina, and it also happens to be home to one of our favorite gamefish....the smallmouth bass! 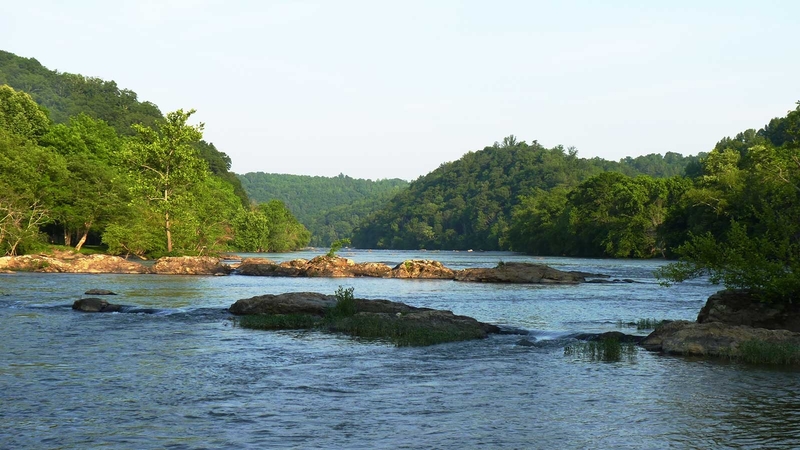 The French Broad near Asheville is a big river — around 300 ft wide. Smallmouth can be caught year round, but the warmer months typically produce the best fishing. Good water clarity is extremely important and can be complicated to predict. Because of the size of the watershed, it can be sunny where you fish, but the water can be blown out by an upstream thunderstorm. A good rule of thumb is to look at the water flow graph. If the river is on the rise, it’s probably muddy. If it is falling or has been constant, clarity is probably good. Float fishing and covering lots of water is the most productive way to target these amazing fish, but wading is possible at some spots. Smallmouth bass in the Little Tennessee, or "Little T” love top-water popping bugs, making it a favorite smallmouth bass destination. It is a Native Fish Conservation Area which means you will spend a day floating the Little T and see very little that is man-made. The river is near the town of Franklin, NC, about an hour drive from our shop in Cashiers. Wade fishing the Little T is possible, but floating and covering lots of water is much more productive. 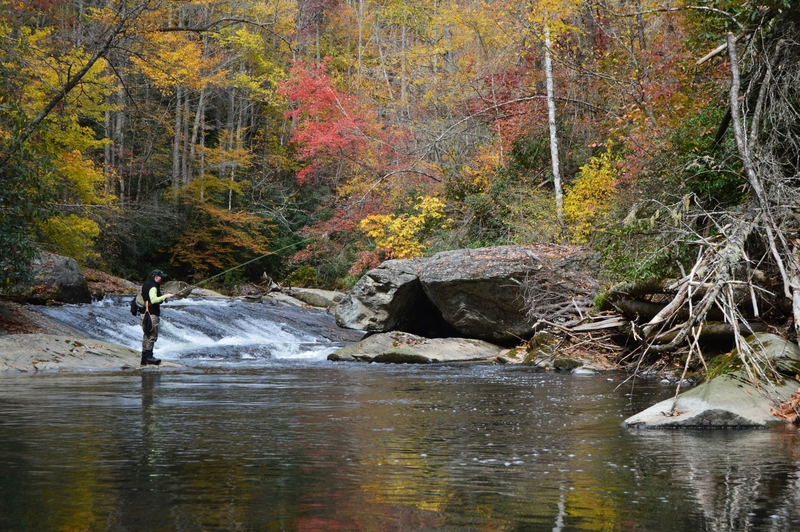 The Ravens Fork is located in Cherokee, NC which is about a 45 minute drive from our fly shop in Cashiers. 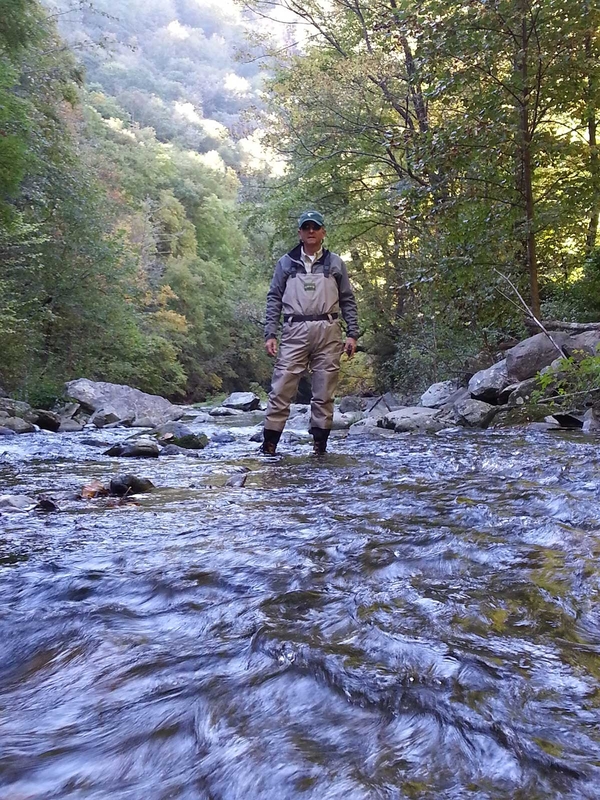 The Eastern Band of Cherokee has designated as “trophy” water approximately 5 miles of this beautiful river. You will need a special fishing license (acquired on the reservation) to fish here. If you are looking for big fish and are willing to think outside the box to accommodate the pressure on these fish, most will agree that its worth paying a bit extra for the license. The Great Smoky Mountain National Park is within an hour drive of our shop in Cashiers. Within the park there are over 2,100 miles of trout streams, all freestone, undammed wild trout streams fed by more rainfall than any other spot in the lower forty eight states. The Park has an extensive and varied human history, as well as long fly fishing tradition. Combining that with the beauty of the streams and the small wild fish in them, fishing here can be an extraordinarily rewarding experience. Panthertown Valley is an outdoors-man's paradise. Rightly nick-named the Yosemite of the East, Panthertown is a valley surrounded by rock wall cliffs caused by millions of years of erosion. 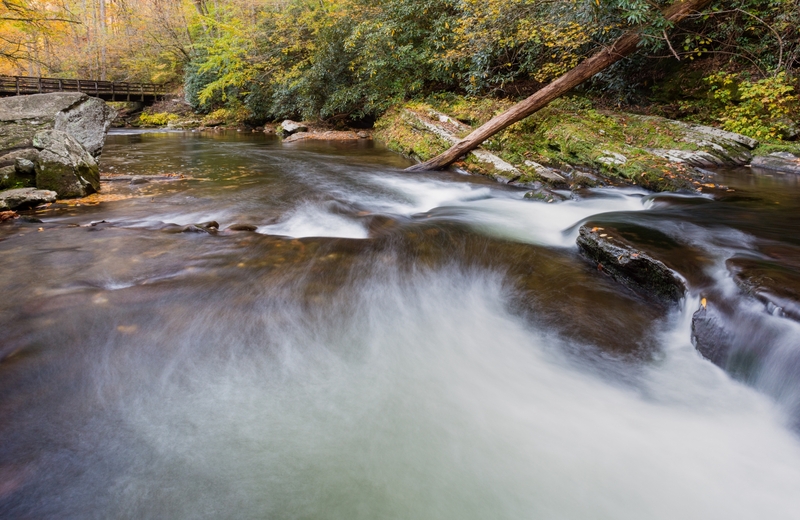 Right in the heart of the valley is where the headwaters of the Tuckasegee River is formed. 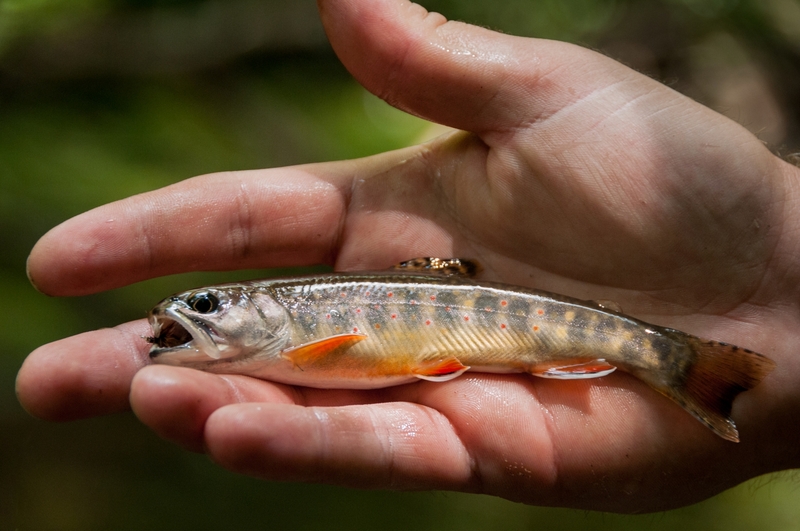 Here in it's headwaters, the only resident trout is the Southern Appalachian Brook Trout. These guys don't get big, but what they lack in size they make up for in beauty. They will also eat a dry fly even when there is no sign of a hatch. 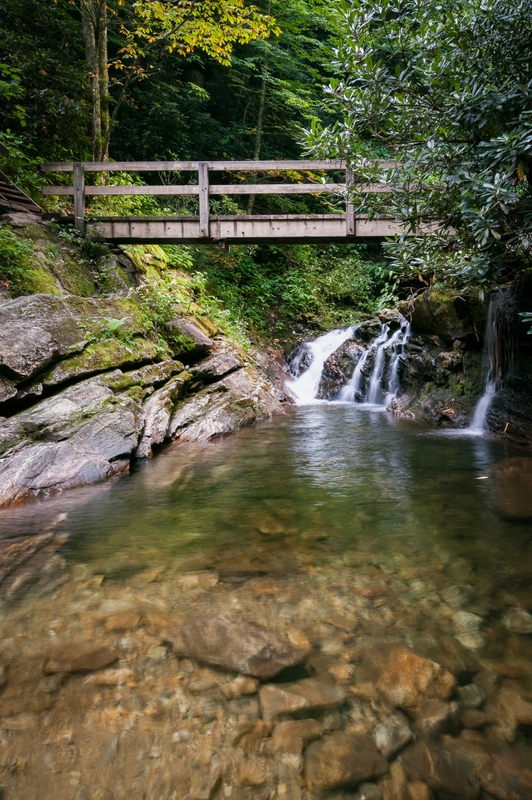 A typical day of fishing in Panthertown Valley involves a lot of walking to and from fishing spots, but it also involves seeing lots of cool waterfalls and views. If you are planning a Panthertown Valley adventure, we highly recommend purchasing a map of the Panthertown Valley (or just hire one of our experienced guides). The Lake Jocassee Drainage consists of the Horsepasture River, the Whitewater River, Toxaway River, and the Thompson River. Because of man-made dams, the Toxaway River and the Horsepasture River warm considerably in the summer making survival tough on trout. However, the Whitewater River and the Thomspon are free-flowing cold water trout rivers. These rivers are home to mostly wild brown trout, although rainbows and brook trout have been caught in both. 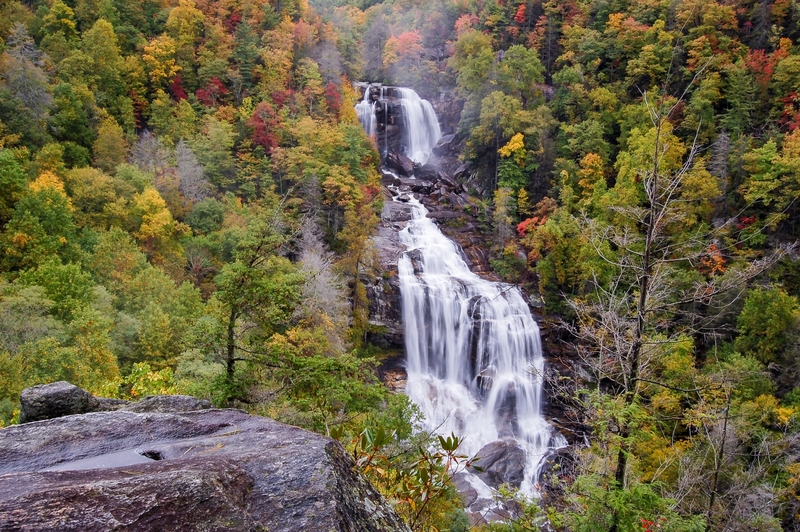 The Whitewater and the Thompson are high-gradient rugged trout streams and have numerous waterfalls on both rivers. 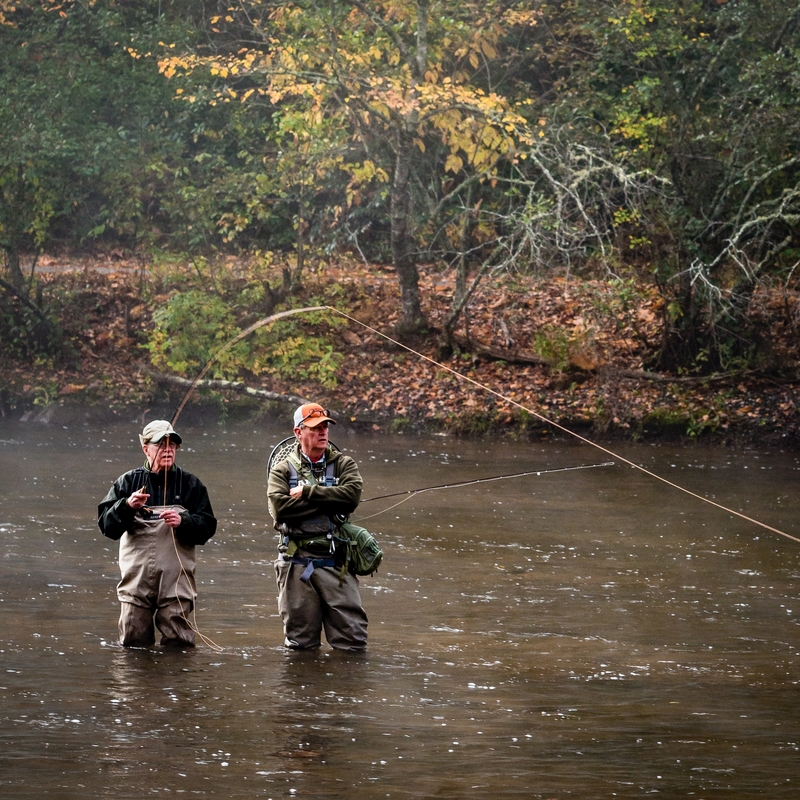 Because of their rugged nature and remoteness, we recommend fishing with a buddy on these rivers. All of which brings us to the countless blue line brook trout streams, so called because they appear on maps as thin blue lines, often without a name attached. Most interest to trout fishers are those above 3000 feet elevation. There are too many of them to count. Brookies in these streams are the fish that have been here forever, the ones Harry Middleton wrote about in On the Spine of Time. Not just wild fish, but wild native fish. They’re mostly tiny and you may need to be in pretty good physical shape to get to them, but if it doesn’t stir your soul to its very foundation to fish for brookies in these streams and to marvel at how they’ve survived the loggers, the erosion, the warming and the poachers, then maybe you need to trade your fly rod in for a set of golf clubs.